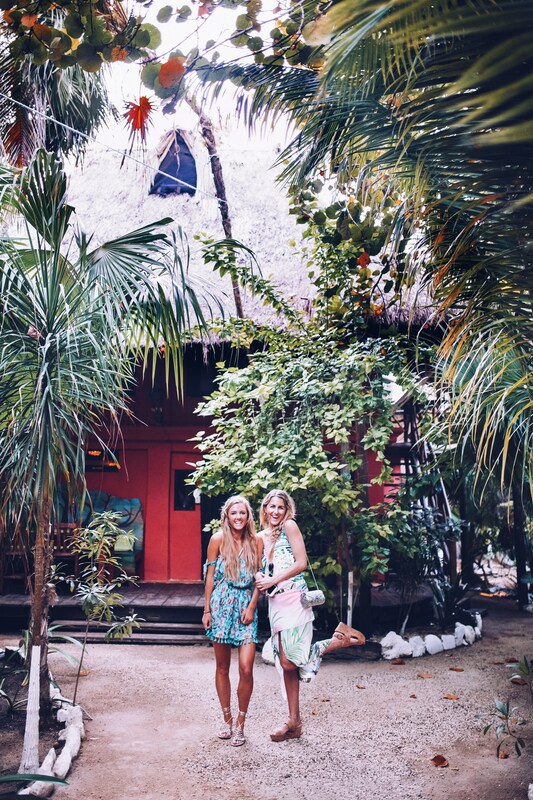 Hotel Tiki Tiki– the cutest hotel located near the downtown of Tulum. Great pool, bar and boutique vibes. We felt right at home during our stay here and made friends with many other guests and staff. About a 20 minute uber ride to the main strip along the beach with trendy restaurants. Airbnb at Aldea Zama– Also located closer to downtown. Lots of affordable, modern apartments available here. Airbnb on the main strip of Tulum Beach– This is the Airbnb we stayed in and it was a perfect location. Located at one end of the main strip, we rented bikes and could easily get anywhere along the beach. Hotel Azulik– Very expensive, but incredible. If you can’t afford to stay here, at least go check it out for dinner or drinks. It is AMAZING. La Zebra– Lively, boutique hotel on the beach with a great beach club and restaurant. Be Tulum– A luxury hotel and spa with rustic charm. My Way Boutique Hotel– Cute, little boutique hotel right in the middle of it all. The Beach Tulum– Upscale, boutique eco hotel. Raw Love Tulum- Tulum is very vegan friendly. We came here one morning for acai bowls and coffee. The iced cinnamon cocao drink is to die for. Posada Margarita- Great vibes, Italian food and drinks. Hartwood- The most famous restaurant in Tulum. Make sure to make reservations or be prepared to start waiting in line for a dinner spot at 2 pm. Gitano Tulum- Great Jungle vibes. Come here on the weekend nights for some cocktails and a DJ spinning the night away. Papaya Project- Another lively spot to hit the town on the weekends. Mister Breakfast- New spot in town with amaaazing breakfast burritos at any time of day. Mama Matcha- Another spot for acai bowls in the morning. I actually preferred this bowl to the one at Raw Love. Get there early to secure a spot on the Insatgram worthy swings. Rent Bikes- There are several spots to rent bikes from along the main strip of Tulum and it’s very affordable, no more than $10 a day. We just walked from our Aribnb until we found the nearest place, which was at a little hotel down the road. Make sure to ask your Airbnb or hotel if they offer them first because we later found out that our Airbnb had bikes for us to use! Cenotes- Go snorkeling or diving in a Cenote. Cenote’s are natural sinkholes that are created when the limestone bedrock collapses and exposes the groundwater underneath. There are several within just 15-20 minutes of Tulum Beach and they are GORGEOUS. Tulum Ruins- The Tulum Ruins are located just at the end of the main strip of restarants, beach clubs and hotels. Get there early to avoid the crowds and tour busses that come down from Cancun. Yoga or Bootcamp- Tulum is a very yoga friendly town. Check out Amansala for Yoga and Bootcamp retreats. Or head to Tulum Jungle Gym to get your own workout in right on the beach! Lounge at a Beachclub- Let’s be honest, this is how we spent most of our days. Is there anything better than lounging on the beach with a cocktail in hand while listening to music?? Our favorites were La Zebra and Coco Tulum. Make sure to read everything about your hotel or Airbnb before you arrive. Tulum is a very Ecofriendly town and many of the accommodations do not have electricity or air conditioning. For example, our Airbnb was solar powered and did not have cell phone service. It was not a problem, but we were glad we read all the details before we arrived so that we were prepared. We were able to connect to the wifi and learned that our electronics charged best during the day when the sun was strongest. Bring enough cash. Most places are cash only, so you won’t be able to get by with just credit cards here. Try to exchange cash at your local bank before you leave because the Airport’s exchange rate is always terrible. Also, the ATM’s in Tulum can be scarce and when you do find one, there is no guarantee that it will have any cash left in it. The good news is, most places will accept US Dollars too if you aren’t able to exchange your cash into pesos. Be aware of the different seasons in Tulum. Tulum’s rainiest months are June, September and October. High Season is January- March, so expect higher prices and surges of tourists. April-September can be extremely hot. The best time to visit to avoid hurricanes, extreme heat and tourists would be October- December. Tulum is about an hour and 45 minutes south of Cancun Airport. We arranged for our hotel’s driver service to come pick us up and it cost us $120. On the way back, we just flagged down a cab on the main strip outside of our Airbnb and negotiated a $90 rate to take us back to the airport. If you’re traveling alone or don’t feel comfortable taking a cab, contact your hotel or Airbnb. Most should have a trusted service for you. If yours doesn’t, try calling some of the mainstream hotels in the area and see if you can pay for theirs. Beware of Rental Car prices. We almost rented a car because it seemed CRAZY cheap! Like $6 a day or something crazy, but after doing more research, I found that they add on some pretty hefty insurance fees once your at the counter and it really doesn’t end up being much cheaper than taking cabs or drivers. Stay near the beach for most of your time. We loved our time at Hotel Tiki Tiki and I would definitely recommend checking it out for a night or two and the downtown area is great to get and authentic Mexican experience (cheap, local food and drinks), but I wouldn’t want to spend all of my time there. The beach area really is magical and all we wanted to do once we got there was bike around and be able to walk on and off the beach from our accommodations. If you want to save money, stay in town for a night or two and then splurge to stay near the beach the rest of your time.